Lakeland Truck Caps Is Wisconsin's largest pickup truck cap manufacturer. 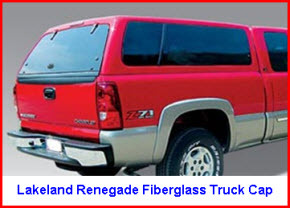 Lakeland Truck Caps has been a family owned automotive accessories business since 1975. The company is currently the largest manufacturer of truck caps and tonneau covers in Wisconsin. Lakeland sells direct to the consumer from 4 stores in Greenbush, Greenbay, Madison and Oak Creek Wisconsin. Both the fiberglass truck cap and aluminum truck cap product lines are some of the most extensive in the industry. In addition, Lakeland Truck Caps manufactures a varied line of commercial truck caps for when you've got to get the job done. You have to visit their website to see the Special Deals, see what's going on and order the truck cap you want because Lakeland doesn't sell through a dealer network. They sell to you - factory direct. Here's why you might just want to take that road trip to Lakeland Outlet Store and pick yourself up one humdinger of a truck cap! An SUV styled fiberglass truck cap from Lakeland. The highest raised roof design from Lakeland. Superior fit and design from Lakeland. A raised roof design for extra headroom and storage space. Lakelands most popular truck cap. You have to check this one out. One of the most economical fiberglass truck caps on the market. A great buy, especially with all the standard features. Lakeland Truck Caps also manufactures 7 varieties of the aluminum truck cap. The varieties differ primarily in the size, number and functionality of windows and doors. Here are some of the common options available on these Lakeland aluminum truck caps and then a short description of each variety. Check out the Lakeland website (link is above) for lots of great pics and enhanced descriptions. Screened centered awning windows at an economical price. 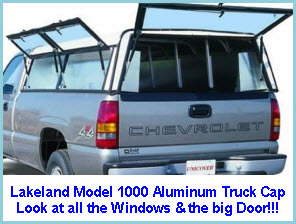 Full glass side with rear sliding screened windows offers the most visibility of the Lakeland Aluminum Truck Caps. Sporty look with Radius side sliding screened windows. Forward mounted side access doors with rear sliding screened windows for better ventilation and improved access. Easy reach with centered side access doors. Wow 2 dual side access 44" doors. Only for 8 foot ruck beds. A centered sliding screened awning window and 2 fixed windows on each side. A 52" fixed window on each side. Wow, you'd think Lakeland would run out of different ideas on what kind of truck caps to make and how to design them. But then, you'd be wrong! 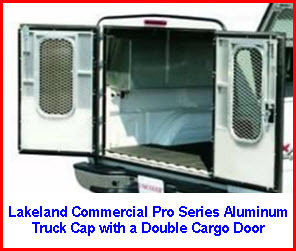 Lakeland Truck Caps also manufactures a heavy duty line of commercial aluminum truck caps. The big difference between the 4 models is what type of rear door you get. So before I succinctly describe each model lets look at some standard features and options. A lift up door so you can get into the back of your pickup. Lift door over tailgate gives great access to work area. The choice of contractors. A hatchback style door to make loading and unloading easy. Full acces to the rear cargo area. Hatchback door replaces tailgate. Double, open out sideways, cargo doors with T handles and 3 point locks. The most popular Work Truck from Lakeland. A single walk in door and optional 30" of cargo height make for easy access and enhanced storage.